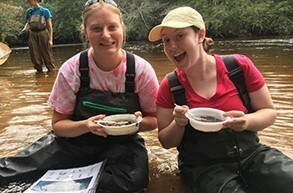 (18/P065) TRENTON – The New Jersey Department of Environmental Protection is seeking 20 recruits for its 2018-2019 class of AmeriCorps New Jersey Watershed Ambassadors, a program that engages communities to protect and improve water quality, Commissioner Catherine R. McCabe announced today. Watershed Ambassadors are the DEP’s facilitators in the field, collecting water quality information, giving presentations on clean water and championing partnership projects in which the public help make a difference in their communities. Applications for the 2018-2019 class will be accepted through Friday, Aug. 31 or until all positions are filled. The state has 20 watershed management areas where ambassadors are placed with a host agency, which include watershed associations, soil conservation districts, municipal utilities authorities and county agencies. Ambassadors work with all sectors of the public to improve the quality of New Jersey’s waterways, foster community-based environmental activities, and empower state residents to make responsible and informed decisions about their conduct and how it affects their local waterbodies and larger watersheds. 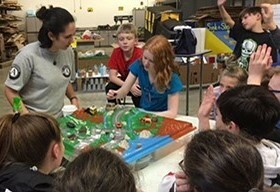 Through their partnerships, field work and thousands of presentations, ambassadors improve New Jersey communities by engaging citizens in science, stewardship and education. Members increase public awareness about the impact of litter and nonpoint source pollution on water quality, as well as the need to reduce nutrient sources such as fertilizers from reaching local waters. This year, Ambassadors worked together with The Nature Conservancy to form a legacy partnership project focused on a regional tree planting project known as “Green the Scene 2018!” Their efforts aimed to restore floodplain areas throughout the state. Through local partnerships with several county and municipal partners, locations in Hackettstown (Warren County), Kingwood, Flemington, Annandale and Pittstown (Hunterdon County), Pequannock and Parsippany (Morris County), Lacey (Ocean County), and Vineland (Cumberland County) received 3,800 trees and shrubs during April and May. These efforts resulted in the Ambassadors Program being honored at the 2018 New Jersey State Governor’s Jefferson Awards for service to the public. Applicants must be U.S. citizens, have a bachelor’s degree, a valid driver’s license, and must have reliable transportation to get to and from field sites. A cleanup in partnership with the Musconetcong Watershed Association, where more than 400 volunteers removed more than 130 bags of trash from 42 miles of public land. Ambassadors serve watershed communities from host agencies throughout New Jersey. Candidates are particularly needed to serve at The County of Passaic Planning Department, the Passaic Valley Sewerage Commission, the Hackensack Riverkeeper, the Great Swamp Outdoor Education Center, the Pinelands Preservation Alliance and Cape May County. For more information, visit www.nj.gov/dep/wms/bears/americorps.htm or call Program Manager Amanda Lotto or Supervisor Patricia Ingelido at (609) 633-1441.